An absolute natural, Don Budge created the concept of the Grand Slam. 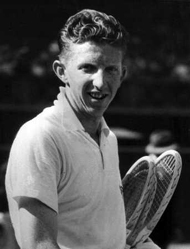 J. Donald Budge: the hero of every tennis player who ever saw him play, and a man whose backhand is considered the greatest shot in the history of the game. Budge was an absolute natural, who never played tennis seriously until he was 14. As he himself told the story, his older brother, Lloyd, challenged him: "Don, you'd have a good chance to win the California State Boy's 15 and Under if you practice, but you're too darned lazy to practice, so forget it." Two weeks before the tournament, Budge started going up to Bushrod Park, a few blocks away from his house, and playing anyone who showed up with a racquet. That preparation bore fruit. In the first round, Budge beat the number one seed and went on to win the tournament. No one played off the ground better than Don Budge The most devastating aspect of his game was his return. No one could follow his serve to the net against him. Jack Kramer is on record as saying Budge was the best tennis player he ever saw play the game. Budge had an aura of greatness. He had a way of making other players feel like they should be his ball boy. He loved the glamour and he was glamorous himself. He drank champagne, he listened Tommy Dorsey, he played the drums. Budge's backhand is still considered one of the greatest shots in the history of tennis. Budge made a premeditated and calculated effort to make tennis history and win the first Grand Slam of tennis: the championships of England, France,.Australia and the United States. This was of course before air travel, when a sea journey to Australia lasted 22 days. Budge put an exclamation point on his amazing feat by only losing five sets in 28 matches. By late 1935, Don Budge had begun to hit his full stride as a totally dominating tennis player. It was not uncommon him to win seven or eight games in a row, regardless of how well his opponent was playing. He was the absolute master of the all court game who never seemed to have a bad day. No one will ever know how good Budge really was because World War II came along to disturb his reign.